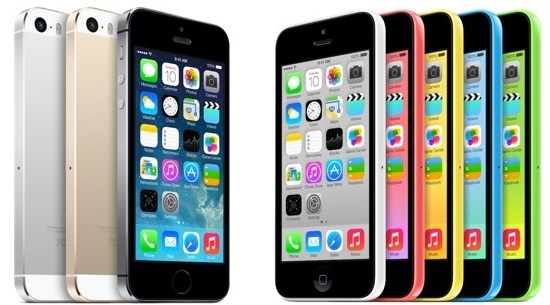 Apple recently unveiled two latest versions of the iPhone 5 – 5C and 5S after rounds of speculations. The latest iPhones will sport a plastic body and an aluminium body for 5C and 5S respectively. While the iPhone 5C will have buyers to choose from 5 different colours – white, green, blue, pink and yellow; the iPhone 5S will flaunt colours like silver, gold and “space gray”. The cheaper version of the iPhone, i.e., the iPhone 5C will be available for $99 for a 16GB model and $199 for a 32 GB model. On the other hand, iPhone 5S will be priced at $199, $299 and $399 for the 16 GB, 32 GB and 64 GB versions respectively. However, these prices are applicable for a two-year contract. Not only this, the protective cases from Apple made specifically for these devices come at $29 for 5C and $39 for 5S. The 5C has a 4-inch retina display and runs on an A6 processor. It comes with an 8 megapixel camera and it is said to offer a better battery life. And above all is the new colourful and shiny look that it is said to appeal to the younger generation. The other version, iPhone 5S will run on A7 which is expected to be twice as fast as A6. The display size and the 8 MP camera bundled with an improved battery life is the same as the 5C. The Touch Id Fingerprint Sensor, dual LED “True Tone” flash with 28 megapixel panoramic photos are the additional features which the 5C does not support. Apple, which has been losing market shares to its rivals including Samsung for months, led to the launch of these new devices to make a comeback. With the 5S and 5C devices, Apple hopes to boost its sales and make more revenue with these new line of products.